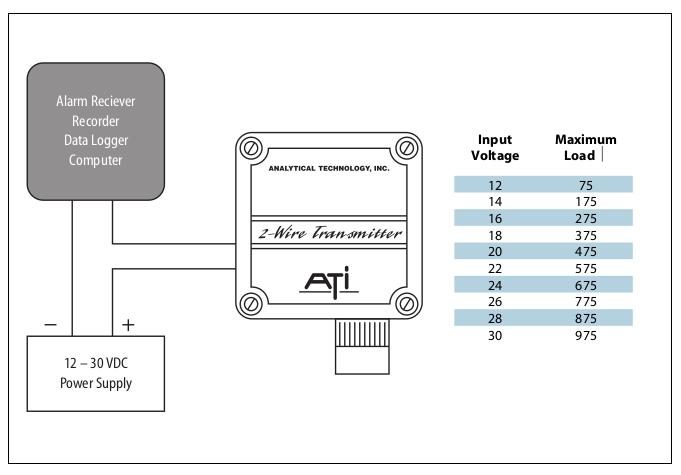 ATIs B12 Gas Transmitter is a 4-20mA loop-powered instrument that transmit a signal linearly proportional to gas concentration. The B12 transmitters area two-wire 4-20 mA transmitter that is loop-powered to signal linearly proportional to gas concentration. They operate from a 24 VDC power supply and the transmitter will drive loads up to 675 ohms, which is sufficient for most monitoring applications. For applications that require battery operation they can operate at 12 VDC with a reduced output load. The electrochemical sensors are designed for use in ambient air or in ventilation ducts, and are not recommended for use in extremely dry air or in condensing gas streams. The sensor is located in one of the knockouts, and additional knockouts are provided on the sides of the transmitter to simplify installation. Transmitters are normally supplied with the sensor close coupled to the NEMA 4X polystyrene enclosure. An optional LCD display can be ordered and is installed on the face of the enclosure and is great for getting the gas concentration. (NOTE: the display must be ordered at the time the order is placed, this cannot be added later). The B12 can also be purchased in an explosion-proof transmitter enclosure that is made out of galvanized steel. Please specify that you want this enclosure by using the drop down under the Enclosure Options and selecting the Explosion-Proof Enclosure. (Picture below). 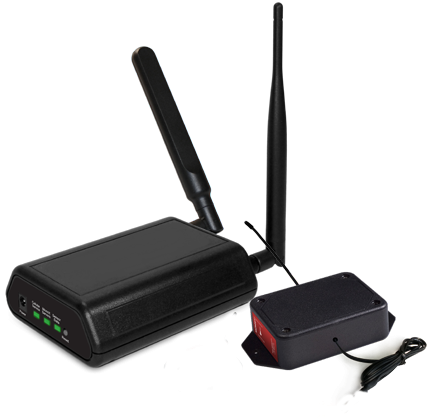 For special applications, a separate sensor can be used that allows you to be up to 25 feet away from the transmitter. Sensor duct mounting adapters can be provided which allows the sensor to be inserted into a duct or pipe through a special adapter. This allows for easy removal of the sensor for service. Pictured above is the Flowcell assembly for the explosion-proof sensor (Part Number: 00-0298). 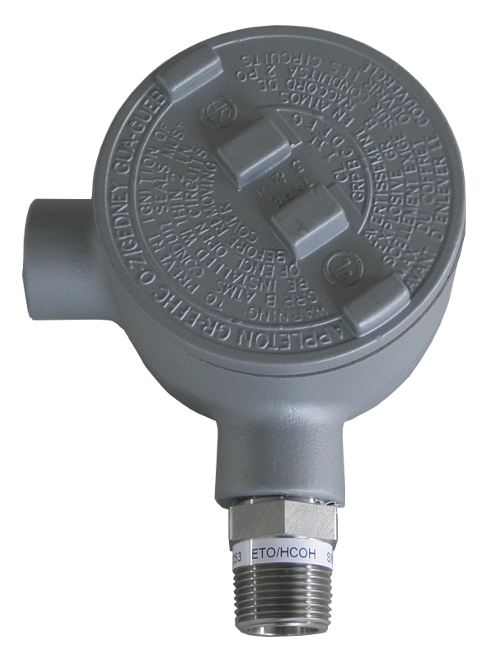 Choose the gas detection required for your application. Range shown is standard range; each sensor can be calibrated for a custom range for an additional $50. See chart below to see minimum and maximum detection ranges for each sensor. Contact us for details on this and to verify we can calibrate for your specific range. NEMA 4X - this is the standard enclosure which is suitable for many environments. Explosion-proof Enclosure - This version is made out of galvanized steel. The LCD display is not possible with this model. Explosion-proof Enclosure with Dual Condulet - Allows you to have a transmitter up to 25 feet away from the junction box. With LCD display - provides local indication of gas concentration (built into front of the enclosure). 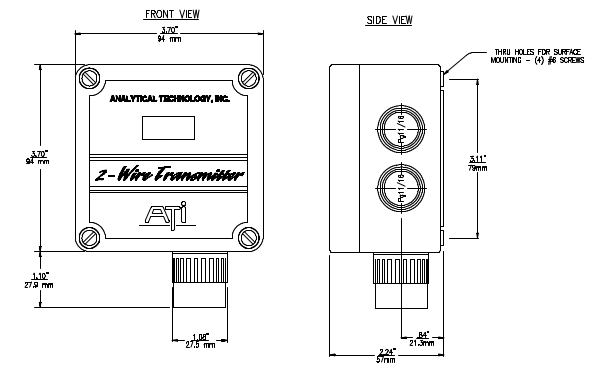 With Separated Sensor - sensor is separated from the transmitter and can be placed up to 25 feet away (cable included). 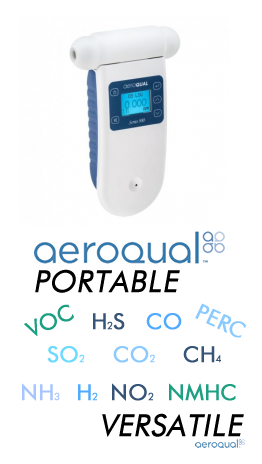 With LCD display and separated sensor - includes the LCD display and sensor is separated from the transmitter and can be placed up to 25 feet away (cable included). With LCD display and duct insertion sensor - includes the LCD display and sensor duct mounting adapters allows the sensor to be inserted into a duct or pipe. Enclosure NEMA 4X Polystyrene Explosion-proof cast iron optional, Class 1, Div. 1, Groups B, C, & D.